Buying Tires Online? Pep Boys has you covered. Tell us about your vehicle and we'll show you the top rated tires from the brands you trust that are most compatible. Tell us your tire size and we'll show you the top rated tires from the brands you trust that are most compatible. Measured in millimeters from the outer sidewall to the inner sidewall at the widest point when mounted. The ratio between the height of the sidewall and its Section Width, expressed as a percentage. The lower the number, the lower the "profile" of the tire. Most wheel rim diameters are measured in inches, and are known as "inch rim" sizes. These are found on most cars, vans, SUVs and light trucks. Some heavy trailers, van and trucks use a half-inch measure. In addition, some rims are measured in millimeters. It's very important that your tire and wheel diameter match exactly. This should be confirmed before installation. Choose from a family of brands you can trust. Select one of our top brands and we'll show you the best tires to fit your vehicle. Determine how to measure the tread on your current tires and know if it’s time to replace them. Learn more about tire construction and tire repair as well as why, when buying tires, it’s so important to replace all four tires at one time. BUY 3 TIRES, GET THE 4TH FREE INSTANTLY! 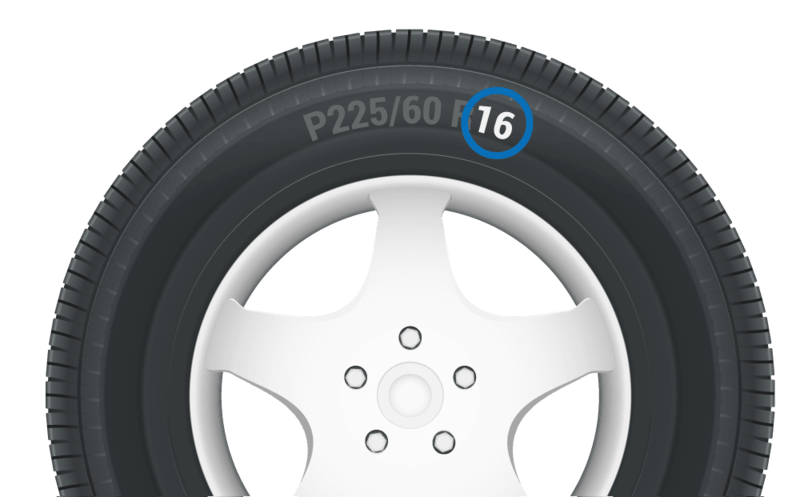 If you’re looking to buy tires online, the Pep Boys online tire shop has you covered. We offer a wide range of tire brands you know and trust at discount tire pricing. When you buy a premium Michelin, BF Goodrich, Pirelli, Continental, or Goodyear tires, you receive the guaranteed lowest price for your tires, as well as special financing, lifetime tire rotation and our Pep Boys limited warranty honored at more than 1,000 locations. Hundreds of stores, one focus. At every Pep Boys store, serving out customers with attention and care always comes first. Find one near you. At Pep Boys, we make sure you have the facts so you can make smart, educated decisions. Learn what makes tires great so you can choose the very best tires and wheels to suit your needs. The Penny Test is a quick and effective way to measure a tire's tread depth and taking it once a month can alert you that it’s time to replace your tires. Taking care of your tires is important to their longevity and keeping you on the road. Here are 5 easy tire care tips that can help to extend the life of your tires. Buying a new set of tires for your vehicle can be an intimidating process, but Pep Boys is here to help with a handy guide of things to consider when buying tires. Pep Boys takes the guesswork out of buying tires. From information to installation, we've got you covered. You can shop by vehicle, or shop by tire size to find the perfect tire for your vehicle. For your convenience, you can choose to schedule installation, pick up your tires at your local store or have them shipped to your doorstep. Pep Boys is a one-stop shop for all of your tire needs! Potholes are known to damage more than just your tires, as they tend to cause your vehicle to become misaligned. Learn about the obvious signs that an alignment is needed, and if an alignment or balancing is right for you with this helpful guide. Imbalanced wheels can cause a weird vibration in your steering wheel when you're driving at highway speeds, shaking when your car picks up speed, or even wear out your tires quicker than normal. Buying tires can be stressful, but Pep Boys is here to help. Tell us a little bit about your vehicle and driving priorities, and we'll match you with tires that match your needs! Proper tire maintenance is key to maximizing the life of your tires. Getting a tire rotation on a regular basis, as well as paying attention to your tire pressure and wheel alignment, will keep your tires rolling longer. Buying tires online can be a difficult experience but Pep Boys is here to help make it as easy as possible. We offer tires on sale, discount tire pricing and more online and at over 1,000 locations. If you’ve suffered a flat tire or tire damage, you can easily purchase tires near you online and get them installed same-day! You can shop tires by vehicle, tires by size, or tires by brand and pick up your tires in a store. There are tire manufacturer rebates as well as Pep Boys rebates and we also offer tire financing options with our Pep Boys credit card. What Vehicle Would You Like Tires For? equips your vehicle with only one possible size. > Don't See Your Tire Size? Please Select a Distinct Feature for Each of the Ranks Above.